No one relies on their ammunition’s performance like law enforcement professionals do. The rounds in their firearms may only not spell the difference between life and death for them, but for the people they have sworn to protect as well. 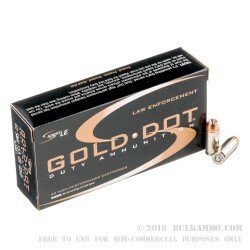 That’s why Speer Gold Dot’s superlative reliability, laudable terminal performance, and laser-like accuracy has made it the top choice of ammunition in the law enforcement community. 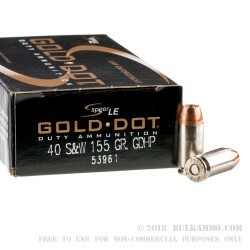 This 40 S&W cartridge by Speer Gold Dot features a 155 grain jacketed hollow point projectile. 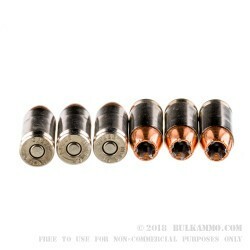 The bullet’s jacket is electrochemically bonded to its alloyed lead core, practically eliminating separation of the two while the projectile is mushrooming within its target. 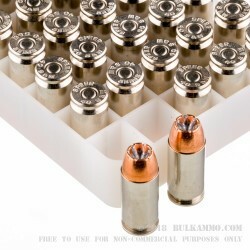 Along with its smooth feeding nickel plated brass casing, clean burning propellant that ensures optimal and consistent velocities, and sensitive and reliable CCI primer, this is a cartridge you can count on when the situation demands your ammunition performs without fail.